Whether you believe the world is coming to an end soon or not, recent natural disasters have illustrated that when Mother Nature strikes, the only person who’s going to help you survive is the one you see in the mirror. You’re going to get plenty hungry if you wait for the government to show up with a supply of food and water. So, you better start thinking about survival now before that unexpected emergency arrives! Take the time now to prepare your family’s emergency food supply that can stay fresh without the need for refrigeration. In addition to having enough non-perishable food on hand, you also need to find a way to protect that food supply from the changing elements. Otherwise, flood waters, power outages, and destructive winds could quickly render your food stockpile useless, ultimately affecting your ability to survive. 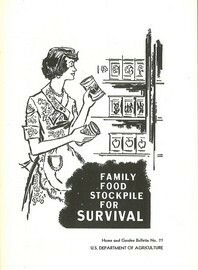 How Much Food Should You Stockpile? Forget the 3-day supply of food that the government recommends. At least 2 weeks of emergency food supplies should be kept on hand at all times. Many believe that every single person should have a minimum of 3 months worth of food and water on hand at all times. With even better planning, your pantry could keep you and your family supplied with food for an entire year. The whole point is advanced planning can make a huge difference when it comes to emergency food preparation and survival. With a little advanced planning, you can include most of what you normally eat on a daily basis into a lifestyle that doesn’t include refrigeration. This can all be stockpiled for use in an emergency. Don’t wait to put your family’s emergency food supply together, or it could be too late. In fact, it’s something that should be done over time, rather than all at once anyway.